"A significant amount of investigation and remediation has been done by GE to abate the pollution problems at the plant sites… The plant sites no longer appear to be sources of PCB to the river of large scale significance." 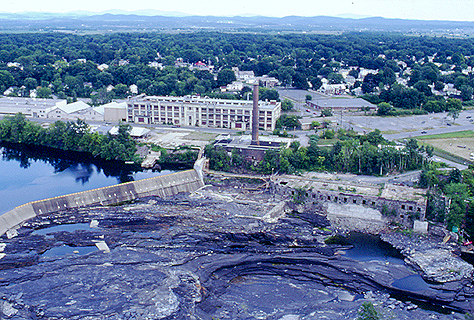 GE has been undertaking major environmental cleanups at its plant sites in Hudson Falls, and Fort Edward, N.Y., where PCBs once were used in the manufacture of electrical equipment. The New York State Department of Environmental Conservation, which supervises GE’s work, has concluded the plant sites are no longer a significant source of PCBs to the Hudson River. At Hudson Falls, GE has begun to address soils contaminated with PCBs that are located beneath the former manufacturing building, which was demolished last summer. More than 18,000 cubic yards of soil and 3,600 cubic yards of building demolition debris will be removed and transported off-site for treatment and/or disposal. After excavation is completed, clean soils and debris materials will be placed within the excavated area, an engineered soil cover will be installed and the cover will be vegetated. A system of underground tunnels capture the small amount of PCBs migrating in bedrock to the Hudson. A vertical shaft — 24 feet in diameter and 200 feet deep, and a horizontal tunnel — totaling about 975 feet, in the shape of a Y at the bottom of the shaft, are 12 feet in diameter (about the size of a railroad car) and are situated 80 feet below the river. Nineteen collection drains were installed to intercept and drain water from fractures in the bedrock above the tunnels and beneath the Hudson. These drains allow groundwater to flow into the tunnels, where it is collected and pumped to the on-site water treatment plant. GE has dismantled the buildings on-site that are no longer being used, and has relocated and upgraded this water treatment plant to a new, 13,000-square-foot, one-story building. The final phase of cleanup involves addressing PCB-containing soils on the property. In Fort Edward, a network of underground wells on and near GE’s former manufacturing facility has collected nearly 500 million gallons of water and shrunk a plume of contaminated groundwater by 50 percent. Contaminated soils and sediments have been removed, and a PCB recovery system to collect kerosene and PCBs in groundwater has been installed. GE expanded this recovery system with the installation of four vertical wells and two, state-of-the-science horizontal wells beneath the plant’s parking lot. The system ensures that groundwater containing PCBs and other contaminants is collected before it migrates from the site. A long-term monitoring program is conducted by GE to evaluate the effectiveness of these measures. To address potential contamination of nearby residential drinking water wells, GE regularly tests the wells and has provided free connections to the public water supply to more than 70 homeowners. GE also investigated potential impacts to soil vapor — the air underground — south and west of the plant site. Although not required to do so by New York State, GE offered indoor air sampling to any interested property owner within a broadly defined study area. As a result, indoor and underground air was tested in more than 50 homes and in no instance were the state’s protective indoor air guidance levels exceeded. Despite that, where compounds of concern were detected at any level in soil vapor in the area — including many homes with no vapor detected — GE offered to install depressurization systems to prevent the compounds from entering homes. GE also pays for the electricity to run the systems and inspects and maintains the systems, when needed. Finally, GE continues to monitor conditions of an area located along the east shore of the Hudson where the plant’s former discharge pipe was located.